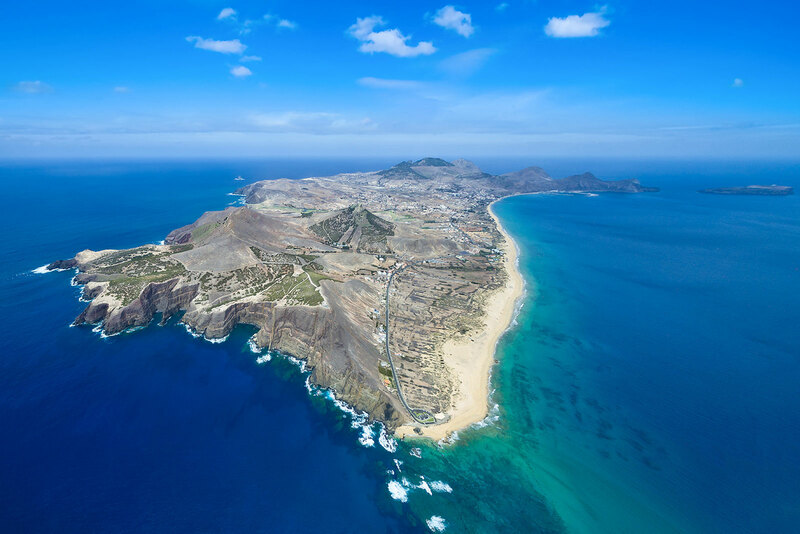 Porto Santo: most everyone has never heard of Porto Santo. … and honestly why should one know about such a tiny island lost in the Atlantic? Porto Santo is often called the little cousin of Madeira Island. However, the two islands could not be more different. Madeira is mountainous and covered with green lush vegetation (on the North Coast). Porto Santo is even smaller, has only one town, low massifs and covered with low vegetation and spiny shrubs. Furthermore, the climate is dry and generally warm enough to swim the year round. However, Porto Santo does have something Madeira is very jealous of, namely a long (9 Km) golden therapeutic sandy beach. Porto Santo is the perfect place to relax and unwind. Except maybe in the Summer when Madeiran’s jump on the ferry to spend their holidays on a real golden beach (not imported sand like in Calheta and Machico for example). 600 years ago, in 1418, the first Portuguese moved to Porto Santo. Today, the tiny island is home to one of the most prestigious golf courses of Portugal. There are however many other activities available. Porto Santo is famous for its clear waters and diving site. National Geographic ranked Porto Santo as the number one in their top 10 diving sites. The museum of Christopher Columbus is located in the main and only city of Vila Balea. In 1478, Columbus came to buy sugar and married the governor’s daughter instead. Big festivities commemorate his passage every year. There are some interesting geological features to explore such as the Pico de Ana Ferreira for example (left picture). Fonte da Areia is also interesting with its seldom inland sand formations (right picture). Furthermore, quaint coves (Zimbralinho Beach for example – middle picture), water sports and walking await those not interested in pure beach holidays. With 5000 inhabitants and less than 10 hotels on the island at present, tourism is definitely the main driving force of the island. There is an airport on Porto Santo and daily flights from Madeira’s Cristiano Ronaldo International Airport. The duration of the flight from Madeira to Porto Santo is 15 minutes. During the Summer, other charters also land at PXO (the IATA code for the airport). However, the most popular transportation method is the ferry boat. It leaves the harbor in Funchal every day around 8AM (please check for correct hours) and returns in the evening around 6PM. Many use this ferry for a one-day excursion. Please do check the website of the ferry company for prices, timetable and to book your tickets. Ilhas Selvagens – Selvagens Islands or Savage Islands.